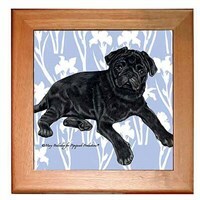 PPug design kitchen accessories in a variety of styles including pot holders and trivets. The Pug dish towel set is a kitchen necessity for all dog lovers out there. The absorbent cotton dish towel is 17 x 28 inches and pairs perfectly with the 7 x 7 inch quilted pot holder. They are packaged in cellophane for an easy gift giving experience. The Pug towel set would make a lovely hostess gift for your next party. Order now so you'll be prepared for that last minute invitation. Practical and fun, the Pug dish towels showcase your love of this cute breed. 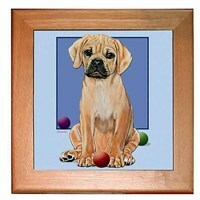 This is one gift that will keep on giving forever with your divine Pug Trivet. There won't be a long face in the house when you showcase this beautiful 8 x 8 inch Trivet made with Soft Non Slip Cushions and a Pinewood Frame made right here in the USA. Heat Resistant for use as a Hot Plate, the Pug Trivet also includes a Pre-Drilled Hole for Hanging. This sweet canine trivet makes the ultimate gift for any fan of this one of a kind breed. 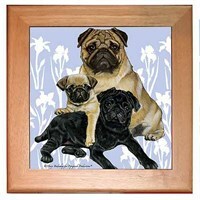 This is one gift that will keep on giving forever with your divine Black Pug Trivet. There won't be a long face in the house when you showcase this beautiful 8 x 8 inch Trivet made with Soft Non Slip Cushions and a Pinewood Frame made right here in the USA. Heat Resistant for use as a Hot Plate, the Pug Trivet also includes a Pre-Drilled Hole for Hanging. This sweet canine trivet makes the ultimate gift for any fan of this one of a kind breed.